As ominous and, well, perfectly Stalinesque a statement that may have been; it didn’t originate with him. The sentiment likely first appeared in the pages of The New York Times in 1880. If Democrats really care about the integrity of elections, then they should be clamoring for a Special Counsel to investigate deliberately slow and secretive vote counting that routinely swings elections to the Democratic Party. America today faces a new sort of electoral imperialism rooted in the same old sentiment—that he who counts the votes matters more than the votes themselves—and The New York Times and its compatriots in the media are quite simply failing to notice. The old saying goes that Democrats do well in early voting while Republicans do well on Election Day. In 2018, it may be added that Democrats do exceptionally well after Election Day. Here in Wisconsin, Democrat Robyn Vining claimed victory over Republican Matt Adamczyk in a State Assembly race after Wauwatosa City Clerk Carla Ledesma (a very partisan Democrat) announced after Election Day that her office had not yet reported all of its votes. Wouldn’t you know it? They flipped the race from a 21-vote lead for Adamczyk on Election Night to a 132-vote win for Vining the next day. In two different U.S. Senate races—Montana and Arizona—Republicans ended Election Night thinking they had won, only to have the Democrats (Jon Tester and Kyrsten Sinema, respectively) pull ahead in votes counted over the next few days. In more than a dozen House races, it was the same story: Republicans ended Election Night ahead, but Democrats came back to win once all the votes were counted (or found). Now how, one wonders, did that happen? And, more tellingly, how does that only ever seem to happen in one direction? Why do votes counted after Election Day always seem to tip the scales to Democrats? Of course it is. Of course it is. The funny thing is that no one seems interested in asking why; and not just in California. 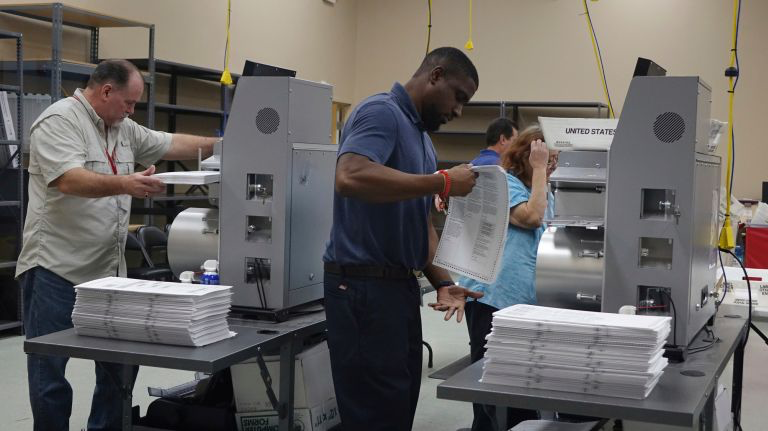 Every one of Florida’s 67 counties managed to finish counting their ballots on Election Day…except two of its most heavily Democratic counties, that is. Only Palm Beach and Broward County needed more time to, ahem, make up ground in tightly contested Senate and gubernatorial races ostensibly won by Republicans. Broward County in particular has been a hotbed of mischief for years, starting from almost the moment that Democratic Supervisor of Elections Brenda Snipes was appointed 15 years ago. In 2004, she failed to deliver roughly 58,000 mail-in ballots to voters who had requested them. Eight years later, her office simply didn’t count 1,000 votes that were found a week after the election. In the 2016 presidential primary, complete results were posted on the county’s website before the polls closed. That October, it was discovered that a medical marijuana referendum was left off of thousands of ballots. Earlier this year, a judge ruled that Snipes had ballots from the 2016 election destroyed 12 months afterwards (not the 22 months after as required by law), which might have been chalked up to mere incompetence…if those ballots weren’t the subject of a lawsuit against her office at the time. That makes it appear more like destruction of evidence. Just three months ago, a judge ruled that Snipes failed to follow the law and ordered her to change the way in which she handles absentee ballots. Her office had been opening them in secret. Think about that for a second: she wouldn’t say how many ballots were left to be counted. Why not? Were there some blank ones floating around somewhere waiting to be filled in? Well yes, as strange as it sounds, there were—in the back of a rental car at the Ft. Lauderdale airport. Unsurprisingly, the plaintiffs in both of those lawsuits were Republicans who believed Snipes was violating the law in an effort to tip the scales to their opponents. Unsurprisingly, Republican Governor Rick Scott’s Senate campaign has sued Snipes over her refusal to even state how many ballots were left to be counted three days after Election Day. Think about that for a second: she wouldn’t say how many ballots were left to be counted. Why not? Were there some blank ones floating around somewhere waiting to be filled in? Well yes, as strange as it sounds, there were—at the Ft. Lauderdale airport, where security found boxes of blank ballots in the back of an Avis car that, no lie, Snipes admitted came from her office. The last person who had rented that car was reportedly a registered Democrat named Noah Holliman, who (naturally) works in Snipes’ office. There certainly could be an innocent explanation for this, but it’s difficult to see what that could be. What possible reason could an election official have for transporting blank ballots—in secret—to an airport of all places? For a political party so laser-focused on Russian efforts to interfere in an election they lost, Democrats seem totally unconcerned with election misfeasance that always tends to benefit them. The truth is that each is as great a threat to the very foundations of democracy. If Russians buying Facebook ads can, as this country has been told for two years now, shake the American Experiment to its core, then even the appearance of impropriety in votes after Election Day that consistently swing elections to Democrats must be treated with the same grave seriousness. In other words, if Democrats really care about the integrity of elections, then they should be clamoring for a Special Counsel to investigate rather obvious attempts at election rigging in Broward County and every other location whose deliberately slow and secretive vote counting routinely swings elections to the Democratic Party. This is the real threat to democracy, and it’s occurring in plain view.